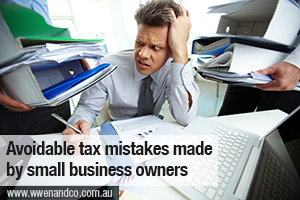 Too many businesses fail because they don’t plan for their tax commitments well enough. From payroll tax to superannuation guarantee contributions to GST, we’ve seen businesses wiped out by huge penalties and tax debts because they kept putting off their obligations. Not keeping good records – Good records means good business – there’s no way around it. Not getting the status of workers right – Not getting the engagement status of workers right can land employers in unforeseen hot water. Not paying the superannuation guarantee, or on time – When cash flow becomes an issue, too many businesses leave superannuation guarantee payments until last. Not keeping track of changes to tax laws – Did you know payroll tax rates changed this year? If you’re not following tax law closely, it’s understandable you’ll miss things. Need help to avoid those 5 business failure mistakes? Then call our Epping office for help from our chartered accountants and tax agents.